What is the recipe for fabulous fall fashion? A healthy portion of cable knit, side orders of faux fur and dark denim, topped off with sprinklings of dark red ochre and burnt orange. Yes, it's good fun blending in with the deciduous leaves as they fall off the trees at this time of year! My autumn wardrobe has been given a much needed injection of fall-friendly colour thanks to the lovely people at Boohoo. I was given the opportunity to trial a brand new way of shopping on their site - inspired by the good old student staple of a meal deal! Boohoo now allow you to create your own autumn style menu by selecting a starter (a pair of shoes), a main (a dress, playsuit, or jumpsuit), and a dessert (a handbag) for £30 all in. As a full time student, any chance to update my seasonal wardrobe on a budget is something that I'll grasp with both hands, so keep scrolling to find out what I nabbed from Boohoo! The foundation of a flawless outfit is a good pair of shoes. For my autumnal look, I selected these chain detail slipper ballet flats, primarily for comfort and versatility. I'm not one of these people who can walk around all day in heels - I'm a flats or ankle boots kinda girl, so these were the obvious choice for me. You can dress these shoes up or down according to your needs and they're actually pretty comfortable too! The synthetic suede material and chain details are simple but stylish - I like the fact that you can team them with other gold accessories and feel oh-so put together. 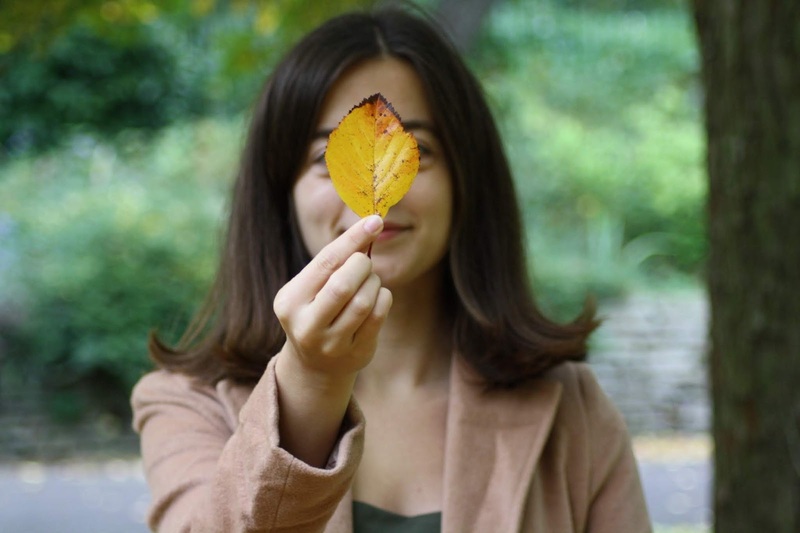 Crunching through the autumn leaves in the park has never looked so good! Just get caught out in the rain in these shoes like I did - you might end up a bit soggy! 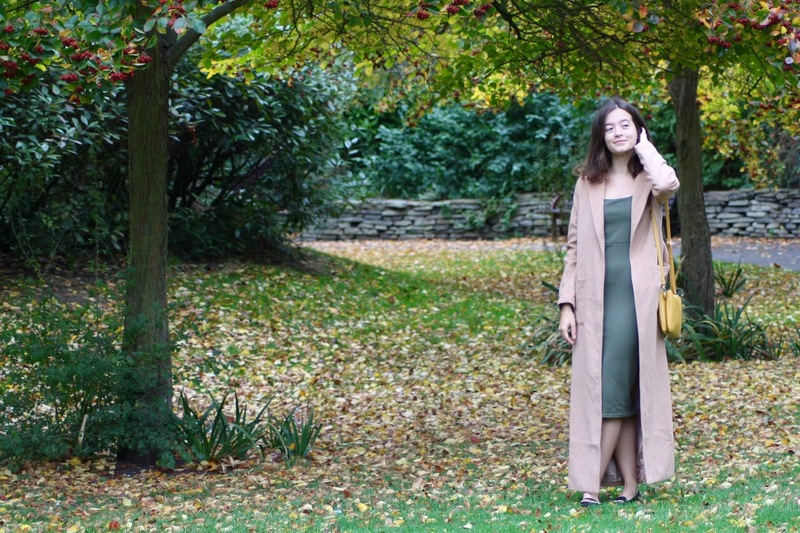 Khaki isn't a colour that is very well represented in my wardrobe but now that I've got my hands on this body-con midi dress, I really don't know why. As someone with dark hair and dark eyes, I think that khaki works really well with my natural colouring. This midi dress is a super flattering cut as well: it is very tight fitting yet the below-the-knee length keeps it a little more modest. However, I would urge anyone wanting to purchase this dress for themselves to be aware of the sizing - I ordered a size up from my usual and I'm very glad that I did so as I don't think I would have got it over my hips otherwise! Because it is cap sleeved, I feel that this dress would work excellently as smart office wear as well as for occasion wear in the evening. This dress will certainly be seeing a lot of use in my wardrobe over the autumn months. The cold weather meant that I paired my dress with a coat that I purchased from Boohoo last year - there are plenty of similar longline duster jackets on their site now. Try saying the name of this bag three times in a row fast! 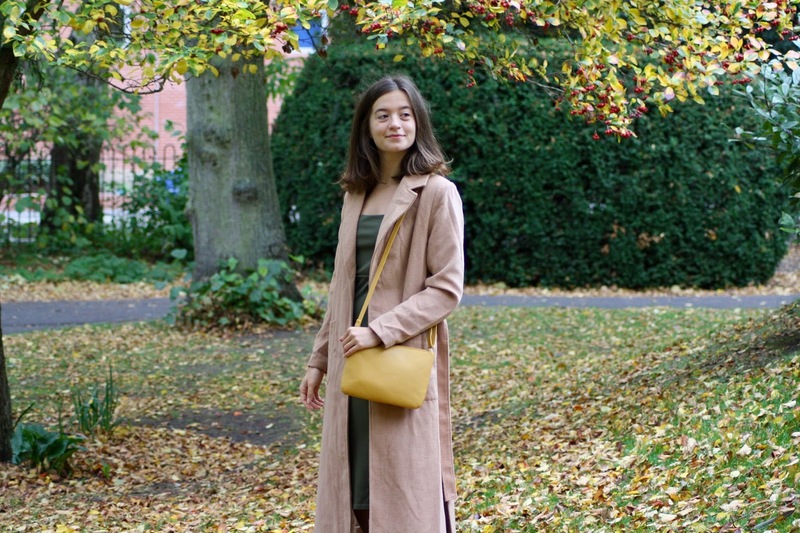 An autumnal outfit wouldn't be complete without an injection of mustard - last year's autumnal outfit post featured a mustard jumper which I still adore but for this year, my brand new double-zip bag provides exactly the same vibe. For a small bag it is surprisingly roomy, easily fitting my phone, wallet and keys inside, as well as the essential pack of tissues for autumn sneezes and a cereal bar in case I get peckish! The security of the cross body strap is a winner for me as well, although this bag does give you the flexibility of clipping off the strap and using it as a clutch. Extra points for versatility there! I really like the gold zips, which match really well with the gold chain of the shoes (and yes, that level of coordination was totally intentional and I definitely didn't only notice it once the outfit had arrived *cough*). So, if you hadn't already guessed, I'm a big fan of the meal deal selection from Boohoo. It's really easy to find a complete outfit at a decent price, especially if you're a last minute shopper! Plus it's WAY more fun than your standard Tesco meal deal offering of a dry sarnie, bag of crisps and a coke! What's on the menu for your autumn style? Let me know in the comments! *The products mentioned in this post were gifted to me by Boohoo in exchange for promotional content. I was not paid for the feature.